SW Steakhouse has a lovely outdoor dining option. 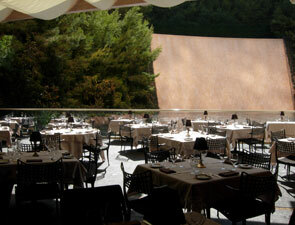 The patio, which seats 88, is beautifully situated on the Lake of Dreams. In the early evening, when it's still light out, you can sit alongside the water with a gentle breeze and immerse yourself in the lavish greenery, the beautiful lake and the cascading waterfall. Sitting at your elegantly set table, you'll feel miles away from the Las Vegas Strip that is located just outside the hotel doors. Later in the evening you'll be dazzled by the multicolored water show described below. A seat at SW Steakhouse ensures that you get a close look at the evening show at the Lake of Dreams. A beautiful kaleidoscopic show with multicolored lights, projections and three-dimensional figurines, this show is not to be missed. In the fall and winter, it starts as early as 6:30 p.m. and runs until 12:30 a.m.; in the spring and summer, it starts at dusk, around 7:30 p.m., and runs until about 1:30 a.m. The show, which runs every half hour, 365 days a year, is amazing. It's abstract theater in the form of an all out lighting show. On the Lake of Dreams, anything can happen. Each show is different, and shows changes seasonally - or whenever management decides to make a change. There used to be a shorter show, which is no longer running, but the longer show is and has always been the most popular. 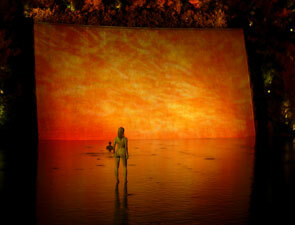 It's complete with props on the mountain, three-dimensional figurines in the pool, and lighting and music vignettes. All the shows are amazing, but we felt that the most fabulous one was the one entitled Rhapsody, which featured beautiful hyacinths, the colors of which could not be more powerful. If you can't make it to SW Steakhouse, you can see the show at the terrace outside Parasol Down; it's much recommended, however, that you attempt to eat at SW Steakhouse, where you can watch the brilliant entertainment while enjoying a perfectly prepared and seasoned steak.